"Panzer AG" is the name of a power noise/aggrotech/rock side-project by Norwegian Andy LaPlegua, the founder of "Icon Of Coil". Formed in Norway in 2004, Panzer AG's sound combines power noise, industrial, trance, rock, gospel music and other genres to create a caustic but danceable form of music. 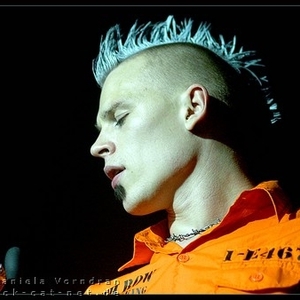 After experimenting with a variety of music styles, such as futurepop with Icon of Coil, as well as electro and industrial with "Combichrist", LaPlegua furthered his sound by increasing the aggressiveness of both his lyrical content and his music. After experimenting with a variety of music styles, such as futurepop with Icon of Coil, as well as electro and industrial with "Combichrist", LaPlegua furthered his sound by increasing the aggressiveness of both his lyrical content and his music. Whereas Icon Of Coil and Combichrist are both pure electronica, Panzer AG combines elements of hard rock, gospel music and symphonic metal. The result was the full-length album, "This Is My Battlefield" on the Metropolis Records label. The album explores the topic of corruption in government and society in a harsh and satirical manner which successfully sets Panzer AG apart from other bands in the genre. Panzer AG followed up the success of 2004's "This is my Battlefield" with the album "Your World Is Burning", released in 2006. In style, it departs somewhat from "This is My Battlefield". It is said to incorporate "more of a 'Pretty Hate Machine era' industrial rock feel."